PLCC package means Plastic Leaded Chip Carrier. A Plastic Leaded Chip Carrier (PLCC) is a four-sided “J”-leaded plastic integrated circuit package with pin spacings of 0.05" (1.27 mm). Lead counts range from 20 to 84. PLCC packages can be square or rectangular. Body widths range from .35" to 1.15". PLCCs are JEDEC standard compliant. The PLCC “J” Lead configuration requires less board space versus equivalent gull leaded components, and is a less expensive version of the leadless chip carrier, which is a housing with flat contacts instead of pin connectors, on each side. 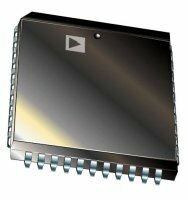 A PLCC device is suitable for use in surface-mount applications or may be installed in a PLCC socket. PLCC sockets may in turn be surface mounted, or use thru-hole technology. The motivation for a surface-mount PLCC socket would be when working with devices that cannot withstand the heat involved during the reflow process, or to allow for component replacement without reworking. Using a PLCC socket may be necessary in situations where the device requires stand-alone programming, such as some FLASH ROM devices. Some thru-hole sockets are designed for prototyping with wire wrapping.